Elizabeth Cady Stanton and Susan B. Anthony founded the National Woman Suffrage Association, or the NWSA. 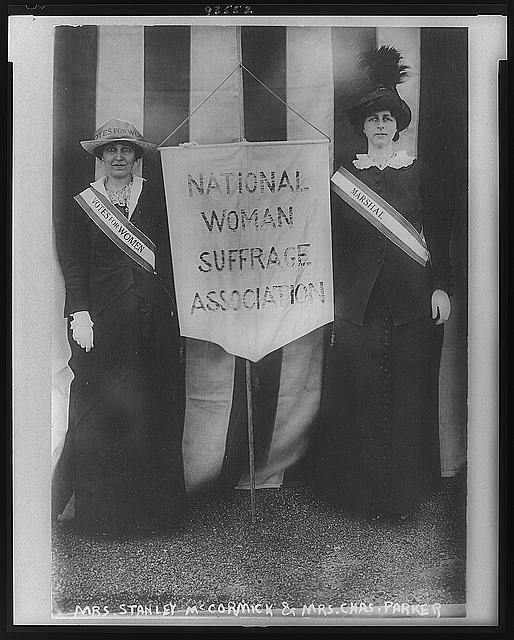 two women holding a nwsa banner, library of congress. The disagreement about whether or not to support the Fifteenth Amendment, which granted African American men the right to vote, led to a division in the women’s rights movement. In 1869, activists established two competing national organizations focused on winning woman suffrage. The National Woman Suffrage Association (NWSA) opposed the Fifteenth Amendment, while the American Woman Suffrage Association (AWSA) supported the new law. Elizabeth Cady Stanton and Susan B. Anthony founded the NWSA first. The pair believed that instead of supporting the Fifteenth Amendment as it was, women’s rights activists should fight for women to be included as well. They started the NWSA to lead this effort. Stanton and Anthony established the NWSA’s headquarters in New York City. They started a newspaper, The Revolution, as the mouthpiece of their women-led organization. The Revolution’s motto was: “Justice, not Favors.—Men, their Rights and Nothing More; Women, their Rights and Nothing Less.” Their paper covered topics including a woman’s right to suffrage, education, and divorce. The NWSA was more radical and controversial than the competing American Woman Suffrage Association, which focused only on the vote. The NWSA wanted a constitutional amendment to secure the vote for women, but it also supported a variety of reforms that aimed to make women equal members of society. What were the strategies of the suffrage organization? Why did Stanton and Anthony organize NWSA? How did the NWSA differ from earlier women's rights movements? Votes for Women A Success. Imitation is the Sincerest Flattery!! "The Map Proves It." Map of the United States showing in various shadings states with full suffrage; partial suffrage; Presidential, Partial County and state suffrage; and no suffrage. Women were granted suffrage from 1869 (Wyoming) to 1914 (Nevada). On May 15, 1869, the National Woman Suffrage Association (NWSA) was founded. The first president of the organization was Susan B. Anthony. This document, the NWSA Constitution, presented five articles the association would uphold. The major goal was to “secure STATE and NATIONAL protection for women citizens in the exercise of their right to vote.” The NWSA was dissolved in 1890 when it and the American Woman Suffrage Association become one, the National American Woman Suffrage Association. Mrs. Stanley McCormick and Mrs. Chas. Parker holding a banner which reads "National Woman Suffrage Association."